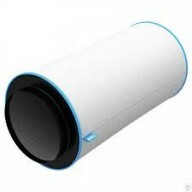 Phresh®: 100mm x 300mm: 350m³/hr air flow. 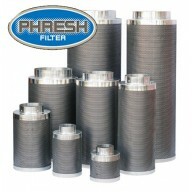 Why choose a Phresh® filter? Phresh® manufacture Multiple Size Filters with some of the best air flow ratings in the market and are an excellent choice for your grow room filtration needs. Phresh® Filters are a high-quality filtration&n..
CARBOAIR 50 100MM X 300MM 410M3/H CarboAir™ 50 has been developed to filter VOCs (Volatile Organic Compounds) from smaller grow room environments.CarboAir™ 50 has a 50mm bed of virgin activated granular carbon. It is the best filter for normal use in smaller grow rooms. 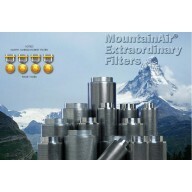 A 50mm bed of carbon is pe..
MountainAir® Filter 0416g: 100mm x 400mm: 310m³/hr air flow. ELIMINATE ALL ODOURS NOW! 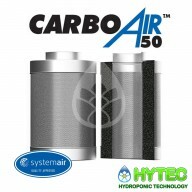 The Activated Carbon Filters remove 99% of everything under 20 microns from the air in one pass. This includes all organic odours. Some of the uses of these superior air cleaners are: &..